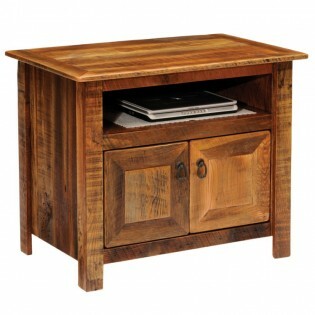 Enjoy the vintage appeal of reclaimed red oak planks from 1800s tobacco barns in your rustic home with our Barn Wood TV Stand. This rustic television stand a cubby for your DVD/Receiver and plenty of storage space behind two door that feature antique rusted hardware. There is a dull catalyzed lacquer finish for extra durability that will retain the wood's natural character.